"I learned how to make these from my Italian mother-in-law. She doesn't have any of her recipes written down. She just makes them like she always has for years. They can be used in other dishes as well (bruschetta, pureed with cream over pasta, etc). I usually just have them on the dinner table in a relish tray as a side dish to any meal." Preheat an outdoor grill for high heat and lightly oil the grate. Reduce grill heat to medium. Grill whole peppers until charred on all sides, turning about every 5 minutes. Place charred peppers in a plastic food storage bag and tie shut. Allow peppers to cool in bag. Combine olive oil, garlic, basil, oregano, salt, and pepper in a 1-pint glass jar (or larger, depending on size of peppers). Remove cooled peppers from bag and scrape off charred skins. Cut peppers in half and remove seeds and stems. 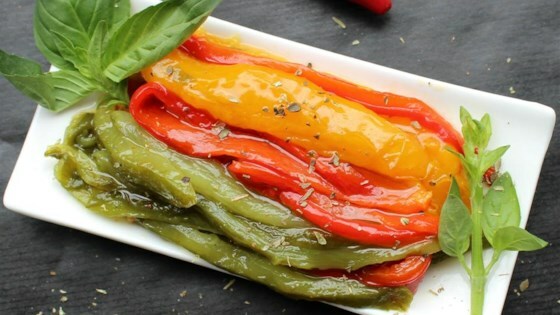 Slice peppers into long strips and place in oil mixture. Mix well, assuring peppers are covered in oil. Serve, storing leftover peppers in refrigerator for up to 5 days. I love this recipe!! And, I always add some red wine vinegar (like 1/4 cup). It makes the pepper a little bit more sour which helps to bring up the appetite and acts as a great appetizer. Fabulous recipe! I can't think of one thing to change! (oops, I did leave out the salt and pepper), really saw no need for those.